There are many foods being touted as super foods and I would like to begin by discussing what they are. Super foods are considered whole foods or foods with minimal processing that have been shown to play a significant role in health promotion. As you may well have guessed, I'm not talking about french fries and doughnuts. These foods are complex, containing an abundance of nutrients that work synergistically in the body to provide a wide range of health benefits. 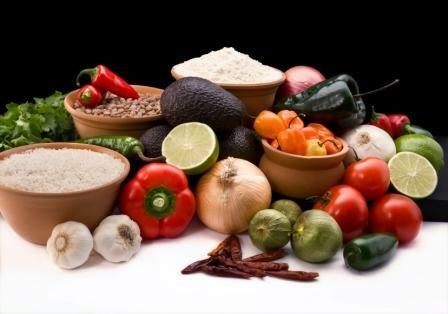 Antioxidants – compounds found in foods that have the ability to slow or reduce the oxidative damage in your body. When oxygen is used, by-products called free radicals are produced. The free radicals cause cell damage and it’s the antioxidants job to scavenge for free radicals in order to help prevent and repair cell damage. Examples of antioxidants are carotenoids, vitamins A, C, and E, flavonoids/polyphenols, lycopene, lutein, lignans, and Coenzyme Q10. Flavonoids – produce a yellow or red/blue pigmentation in plants and have been shown to help modify the body’s reaction to allergens, viruses, and carcinogens. Polyphenols – are natural components of plants that can be classified as flavonoids (anthocyannins, catechins) and non-flavonoids (ellagic acid and coumarin) and are responsible for fighting free radicals and helping prevent cell damage. Phytosterols – act as a structural component of plant cell walls and are insoluble in water but soluble in alcohol. They benefit the human body by helping to lower cholesterol levels. Phytosterols are found in a wide variety of fruits and vegetables, nuts, legumes, cereals, and vegetable oils. Phytonutrients – are organic components of plants that may play a role in health promotion by enhancing immune response and cell to cell communication, modifying estrogen metabolism, and serving as antioxidants. Classes of phytonutrients include carotenoids, flavonoids, and polyphenols, just to name a few. Açai Berries: a type of berry found on the tops of palm trees in the Brazilian rainforest. Their rise to the super foods list is due to their high levels of antioxidants, monounsaturated fatty acids, fibre, phytosterols, and vitamins A & C. Studies have shown Açai berries to have anti-inflammatory, antibacterial and antimutagenic properties. Tip: You can find Açai flavored yogurt drinks in your local supermarket or pick up Açai juices and gel packs in specialty stores or through private distributors. Avocados: are known for their healthy fat content (monounsaturated fat). But did you know they are also high in folate, vitamin E, potassium, magnesium and phytosterols? Not to mention the fact that they improve the bioavailability of other foods. Think of avocados not only as super foods but also as ‘nutrient helpers’ as the monounsaturated fat helps increase absorption of other phytonutrients in your meal, most notably the fat-loving carotenoids in vegetables. Worried about the fat content of avocados? Because avocados contain a fair amount of fat (good fat) your satiety level is reached sooner, in theory reducing your quantity consumed and having a positive effect on your weight. Tip: add avocado slices to your favorite salad, use in salsas, or as a replacement for mayonnaise in sandwiches. Cut avocados should be sprinkled with lemon juice to reduce browning and should be stored in the refrigerator. Blueberries: are rich in phytonutrients, especially polyphenols and flavonoids. Blueberries help with cell to cell communication in your brain – forget the crossword puzzle drills, just eat some blueberries. That’s not all; the ellagic acid found in blueberry seeds has a cancer prevention benefit. Being one of the sweeter super foods, you can easily add them to any dish to improve the flavour and bypass artificial sweeteners. Try a cup of blueberries everyday for optimal health benefits. Tip: buy organic frozen blueberries and add them to your fruit smoothie for an energizing snack. Broccoli: is one of the most popular super foods. It contains vitamins A, B6, C, E & K, folate, calcium, and fibre. The sulfur compounds found in cruciferous vegetables also help protect against cancer. Studies have shown that isothiocyanates found in broccoli stimulate the body’s production of phase II enzymes to neutralize cancer-causing substances before they damage your healthy cells. If you don’t like broccoli, try broccoli sprouts on sandwiches or in your salads. The sulforaphane found in week-old sprouts conveys 10-100 times more power against carcinogens than two spears of mature broccoli. What a powerhouse! Now you know why your Mom told you to eat your broccoli. Tip: unless you’re purchasing from a local producer (farmer’s market, in season) you’re best to purchase frozen as the broccoli is harvested when ripe and frozen to preserve all of its goodness. Cold-Pressed Extra Virgin Olive Oil: contains healthy monounsaturated fat, vitamin E and an abundance of polyphenols. It’s the polyphenols that are behind most of the health benefits. If you want to include olive oil as one of your super foods, make sure you purchase cold-pressed extra virgin olive oil. It provides the most benefits as you are receiving a very high quality olive oil from the first pressing of the olives, where there’s an abundance of phytonutrients that have undergone minimal heat processing. Normally it’s best to pour a small amount of olive oil on your meals after they have been cooked to preserve the nutrients from damaging heat effects. The only exception is when you’re cooking meat. Using olive oil to cook with or as part of your marinade has a healthful benefit. Cooking meat enhances the formation of carcinogenic heterocyclic amines in the product and studies have shown that olive oil reduces this effect. Other studies have shown that people who follow a Mediterranean diet or who use olive oil regularly in place of other fats have a reduced risk of heart disease, type 2 diabetes, colon cancer and asthma. And here comes the best news of all; consuming approximately 2 tbsp of olive oil with your meal helps control blood sugar and helps prevent accumulation of fat around your mid-section. The monounsaturated fat helps increase the breakdown of fat in fat cells and reduces insulin’s ability to block fat breakdown. Go olive power! Tip: purchase cold-pressed extra virgin olive oil in dark tinted bottles that have been stored away from any heat source as both light and heat will have an adverse effect on the phytonutrients. Garlic: is an antiviral & anti-inflammatory agent and is a powerful cancer fighter due to the sulfur compounds, particularly allicin which is formed when fresh cloves are crushed or cut. Garlic also delivers vitamins B6 & C, phosphorus, potassium, zinc, selenium, and polyphenols. Health benefits include lowering blood pressure, protecting against cardiovascular disease, protecting against cancer, and also working as an antibiotic – not to mention warding off mythical vampires. Tip – Using a garlic press will produce a stronger garlic flavor and more allicin than finely chopped garlic. Onions: contain flavonoids, sulfur containing compounds, and anti-inflammatory compounds and have antimicrobial properties. The antimicrobial properties protect against bacteria and fungi and the quercetin has a protective factor against colon cancer. Onions, along with garlic, leeks, scallions, chives and shallots belong to the allium family which is known for its ability to help the liver eliminate toxins and carcinogens. Be sure to include onions on your list of super foods! Tip - the active compounds in onions are separated by cell walls and need to combine to produce the healthful benefits. Make sure you cut the onions and let them sit for 5-10 minutes before cooking in order to allow enough time for the chemical reactions to take place. Pomegranate: is an ancient fruit with powerful anti-inflammatory and antioxidant properties to help the body reduce inflammation and protect the body from free radical damage. The nutrients are in the seeds and the nutrients include potassium, polyphenols, and vitamins B6 & C. You might be surprised to know that pomegranate contains higher polyphenol concentrations than red wine or cranberry juice. The seeds can be crushed to make juice, or used in salad dressings, or as a garnish on your favorite meal. Tip – to get the seeds out, remove the stem, cut into four sections and soak for 5 minutes in a bowl of water, peel back the flesh which will float and the seeds will sink. Skim off the white flesh and then pour water and seeds through a sieve. Spinach: is known as Popeye’s favorite food for building muscles, but there’s a lot more to it than that. Spinach is included on the super foods list due to its abundance of antioxidants, chlorophyll, B vitamins, vitamin K, minerals, polyphenols, and Coenzyme Q10. Studies have shown that compounds in spinach promote heart health, slow cognitive decline, help reduce inflammatory conditions such as arthritis and asthma, and may also help combat ovarian and prostate cancers. Tip – spinach is a great base for salads but make sure you add a little olive oil to help your body absorb the carotenoids, vitamin E and vitamin K.
Tomatoes: are best known for containing lycopene, a class of carotenoids that give tomatoes their red colour. The phytonutrients in tomatoes act as antioxidants, help stimulate your immune function, help mitigate cancer and may slow degenerative diseases. These are all good reasons to add tomatoes to your super foods list. Tip - raw whole foods are great, but it you’re looking for an increased boost of lycopene, eat processed or cooked tomatoes as the processing frees up the bound lycopene in the cell walls of raw tomatoes. The difference in bioavailability is 2-8 times greater in processed tomato products and adding a healthy fat component like olive oil or avocado will assist with absorption. Our lifestyles are filled with processed convenience foods, inactivity, environmental stressors such as pollution and first or secondhand smoke, and our busy stressful work/home environment bombards our bodies with free radicals on a daily basis. Do something good for your body by including fruits and vegetables in your diet, and consume at least two super foods per day.